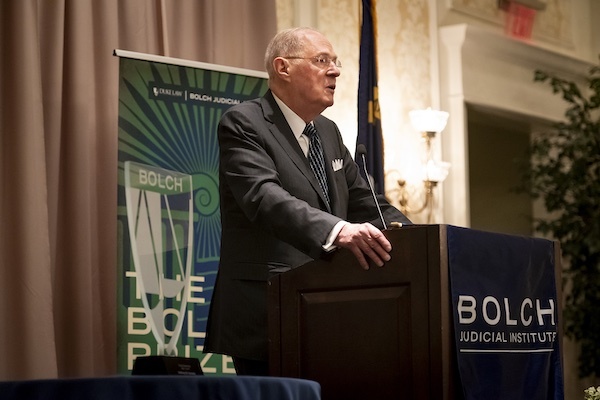 Retired United States Supreme Court Justice Anthony M. Kennedy received the inaugural Bolch Prize for the Rule of Law on April 11, 2019, during a ceremony with Duke Law alumni and leaders from the North Carolina judiciary and legal community. Supreme Court Associate Justice Samuel A. Alito, Judge Allyson K. Duncan of the U.S. Court of Appeals for the Fourth Circuit, and Bolch Judicial Institute Director David F. Levi were among the speakers. The Bolch Prize, given annually by the Bolch Judicial Institute, honors individuals or entities who have distinguished themselves in the preservation or advancement of the rule of law. It is a central component of the Institute’s mission to support and further the rule of law in the United States and around the world. By honoring those who do this work, the Bolch Prize draws attention to the ideals of justice and judicial independence and to the constitutional structures and safeguards that undergird a free society. The recipient is selected by the Advisory Board of the Bolch Judicial Institute. 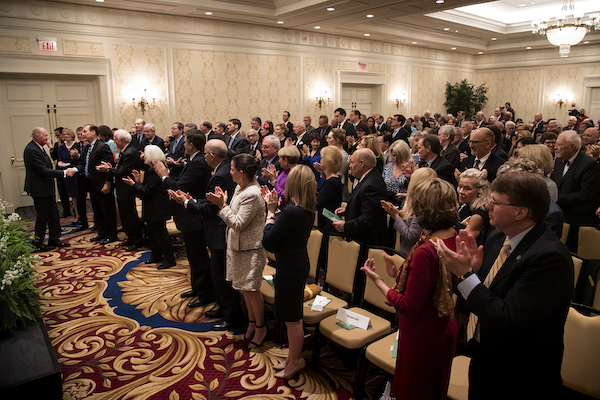 Justice Kennedy was recognized for more than four decades of service on the federal bench, including 30 years on the Supreme Court, as well as his teaching and speaking in support of rule of law principles and civic education in the United States and abroad. Calling Justice Kennedy a “dedicated, unceasing advocate for the rule of law,” David F. Levi, director of the Bolch Judicial Institute, shared a definition for the rule of law that Justice Kennedy developed after visiting China. The definition has since been translated into many languages and adopted by the United Nations Commission on Legal Empowerment of the Poor. “His definition simply and elegantly explains that the rule of law ideal includes the concepts of freedom, equal treatment and individual dignity within a legal system that permits redress and in which the law is superior to official will,” Levi said. Bookmarks bearing the definition were included in the ceremony’s program. Justice Kennedy said he accepted the Bolch Prize on behalf of his family, including his wife, Mary Kennedy, who also attended the ceremony. “It is accepted of course in recognition of the constant efforts by hundreds of people, thousands of people, whose names we do not know, whom we have not met, but who do work day to day in the justice system to preserve and defend the ideas that underlie the rule of law, preserve and protect the rule of law, that is the only secure foundation for the freedom to which we must always aspire,” he said. Justice Alito, who earlier in the day joined Justice Kennedy and Levi for a discussion before an audience of Duke Law students, praised his Supreme Court colleague for his devotion to considering both sides in an argument — “a lesson that our legal system can take to the broader society” — and treating those with opposing points of view with civility and respect, which he said was “fundamental” to the rule of law. 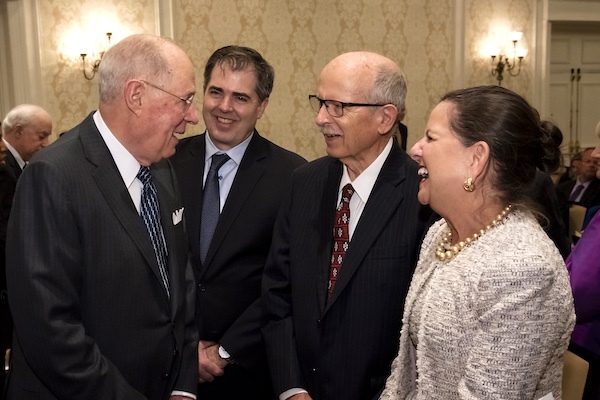 Judge Duncan, who recently announced her retirement from the bench, praised Justice Kennedy for his engagement with lawyers and judges internationally through his annual Salzburg Seminar and other courses. She also described efforts to extend that transnational judicial engagement through such organizations as the International Association of Judges, of which she serves as vice president, and the International Judicial Relations Committee of the U.S. Judicial Conference, of which she is a past chair. Duncan is also a 1975 Duke Law graduate, a member of the Bolch Judicial Institute Advisory Board, and a Duke University trustee. “Efforts like these honor the legacy of Justice Kennedy’s work and continue to strengthen the rule of law and enhance shared understandings of judicial problems that benefit everyone,” Duncan said. 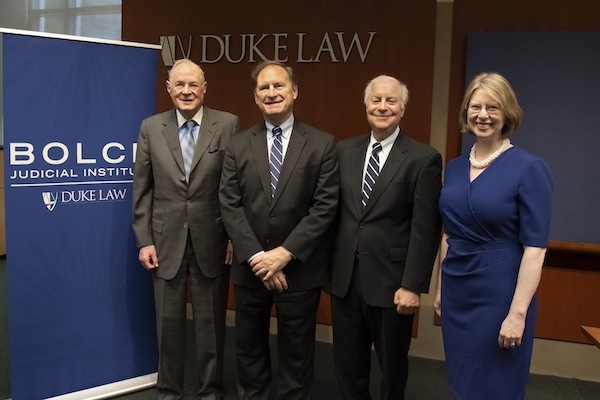 Kerry Abrams, James B. Duke and Benjamin N. Duke Dean of the School of Law and Professor of Law, highlighted the work of the Bolch Judicial Institute and its impact on Duke Law School and the broader community. “We must extend our deep gratitude to Carl and Susan Bolch for their vision, for their generosity, and for shining a light on the slow but steady work of those who bring stability and justice to our society,” she said. The institute — which was established at Duke Law School in 2018 with a $10 million gift from Carl Bolch Jr., a 1967 Duke Law graduate, and his wife, Susan Bass Bolch — develops research, scholarship, and educational programs in three focus areas: the rule of law; courts and judging; and law and technology.